This 45rpm record includes with 'You're So Right For Me' one of the wildest Rockers recorded ever in the 1950s! Born July 5, 1938 in Tin Town, Missouri, just north of Springfield (home of the ‘Ozark Jubilee’), Self impressed ‘Jubilee’ regular Bobby Lord enough that Lord set up a demo session and brought the results to Red Foley’s manager, Dub Albritten. Albritten got Self a contract with ABC-Paramount. 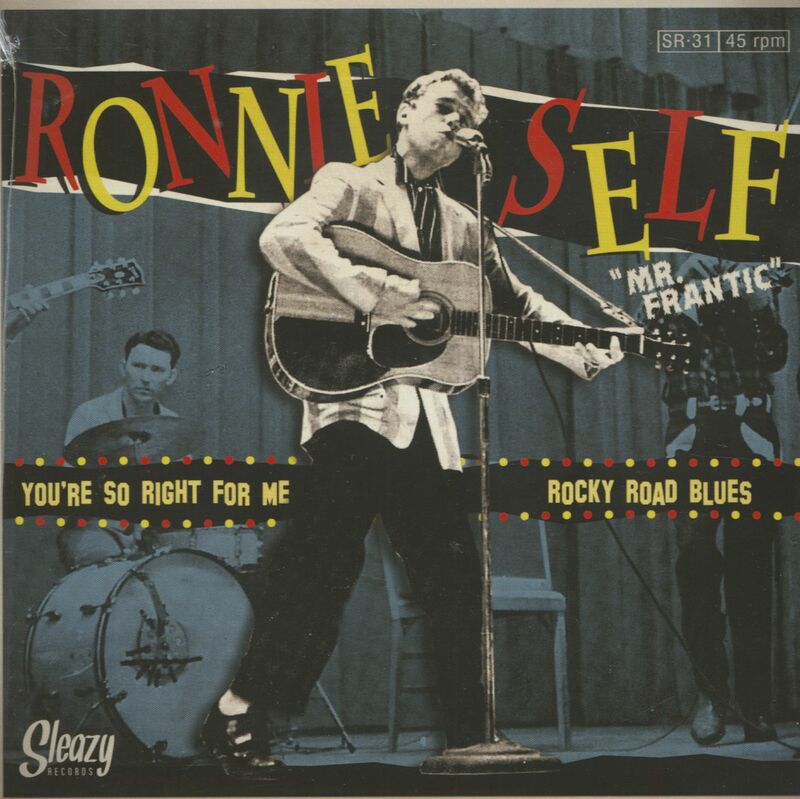 At the age of 18, towheaded Ronnie made his 1956 debut single, the rockabilly classic, Pretty Bad Blues, in Nashville. A second ABC single was scheduled but never saw light of day. Albritten booked Ronnie on the ‘Philip Morris Caravan,’ an all-star touring troupe sponsored by the cigarette company headlined by Carl Smith, Red Sovine, and Goldie Hill. Allbritten moved his protégé to Columbia, where Nashville mainstay Don Law produced Ronnie’s Big Fool b/w Flame Of Love in February of ’57 and the swaggering Ain’t I’m A Dog b/w a remake of Bill Monroe’s Rocky Road Blues in June. They were precursors to Self’s insane rocker Bop-A-Lena, penned by Mel Tillis and Webb Pierce and waxed that December; seldom has a record hurtled along as recklessly (Self co-wrote the relaxed flip, I Ain’t Goin’ Nowhere). 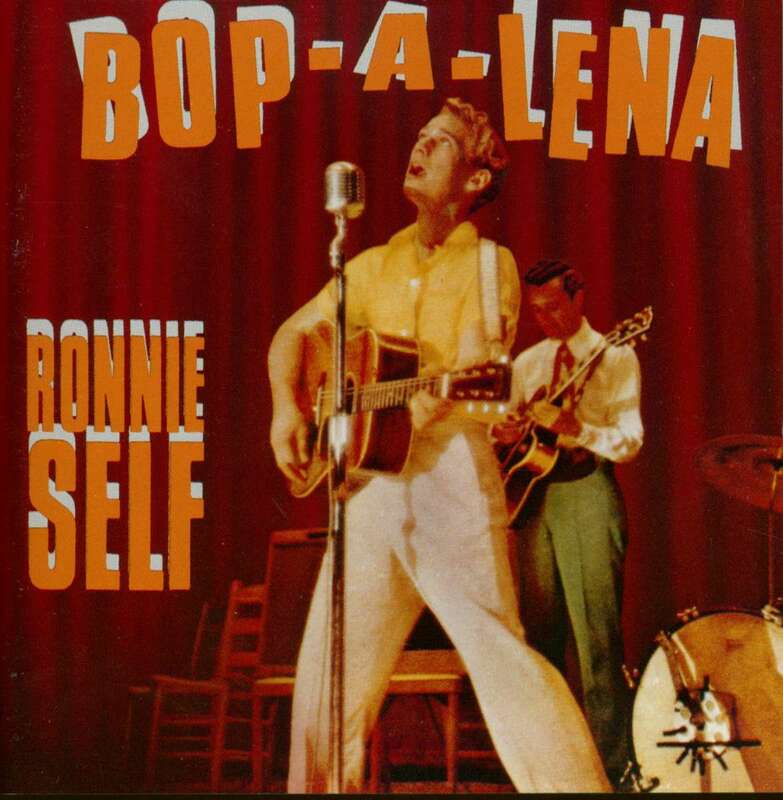 Ronnie cut his next Columbia offering, Big Blon’ Baby, in March of ’58 (Jerry Lee Lewis covered it the following year for Sun), with Date Bait its flip. Petrified, Self’s Columbia swan song, hailed from the same session (it was the work of Tillis and Wayne Walker), with Ronnie’s own careening You’re So Right For Me its plattermate. Self unexpectedly left the ‘Caravan’ when his pregnant wife gave birth. But Albritten got him signed to Decca, where he had more luck writing smashes for Brenda Lee (Sweet Nothin’s and I’m Sorry) than he did scoring his own hits. With Owen Bradley in charge, Self cut his first Decca date on July 17, 1959 with the cream of Nashville’s session aces: guitarist Hank Garland, pianist Floyd Cramer, bassist Bob Moore, and drummer Buddy Harman. Self wrote both Big Town and its party-time flip This Must Be The Place, his voice as raspy and compelling as ever. So High (cut in 1960), Instant Man (1961), and Oh Me, Oh My (1962) saw light of day on Decca, but some of Ronnie’s more inspired creations were buried in Decca’s vaults. Houdini, a loopy 1963 one-off for Kapp, and a Dale Hawkins-produced 1968 45 for Amy pretty much finished his recording career. He died August 28, 1981. 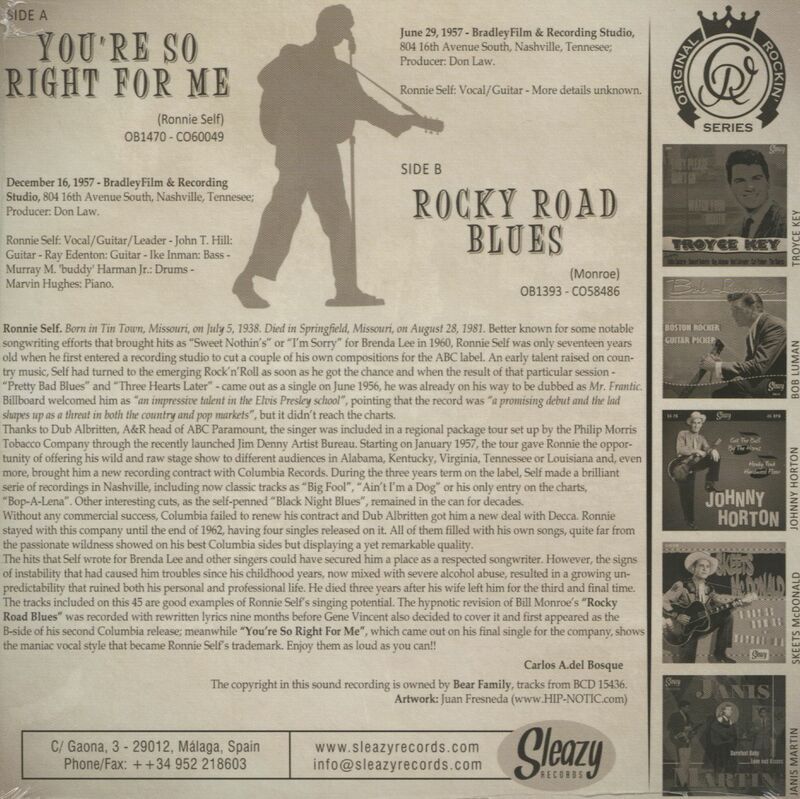 Customer evaluation for "You're So Right For Me - Rocky Road Blues (7inch, 45rpm, PS)"